Somewhat belying the name, we found this to be a very characterful amp – mostly for the better! There are degrees of valve purism. 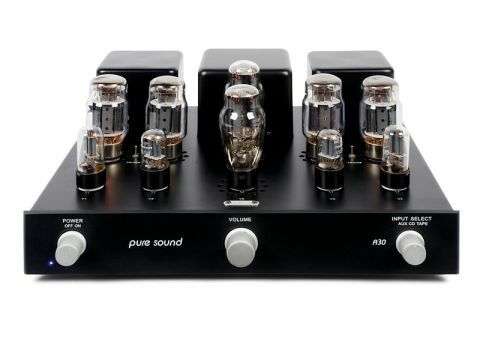 Pure Sound, appropriately enough, takes things a step further than most by using valve rectifiers in the A30, as well as valve-amplifying components. Is there sense in this? Valve rectifiers waste energy compared with solid-state diodes, they cost more and take up space and, like all valves, they have a finite useful life. Despite all that, they do have advantages in terms of turning AC into DC, with minimal high frequency noise generation. Pure Sound has mounted practically all the components in this amp on a printed circuit board, making it, in that respect, one of the more modern designs. Passive components are an interesting mix of the latest parts and old-fashioned specialities like the carbon-film resistors used in many positions. This is another switchable-mode amp, using a separate switch for each channel. There is no adjustment for bias: self-bias is used, which among other things guarantees Class A operation. It's a little ironic that, for similar reasons to those that make valve rectifiers so good, valves are in some ways better suited to Class B than transistors! Definitely something of a characterful performer, this amp will appeal most to listeners who like their music up close and direct. If you prefer something a little more laid-back, the A30's presentation may very well strike you short of aggression and, as such, left one of our listeners nonplussed to the point of active dislike. The others, however, were more inclined to see the positive side of things. Comments were particularly favourable in the classical music excerpts, which are both relatively ambient recordings. The A30 really dug deep into the detail in each and, although there was rather less sense of space around the performers than most of the amps brought out, there was also more insight into the small details. This forward presentation is accompanied by a degree of tonal imbalance; a tilt in favour of the upper midrange and treble. Bass is fair, but not seismically extended, while the very highest treble is nicely open and quite sweet. Dynamics can sometimes seem a little abrupt, with climaxes appearing almost out of nowhere. Again, this is something that will probably appeal to some listeners as strongly as it repels others. Then there's the question of pace. In some ways, not surprisingly given the forward presentation, this is quite a pacey amp. That said, though, its timing is not always entirely convincing. It can sometimes sound a little rushed and the lack of very deep bass reduces the conviction of a driving bass/percussion riff. Note that these comments all refer to triode mode: we tried ultralinear as well, but felt that it merely hardened the sound a little, without really adding anything constructive.